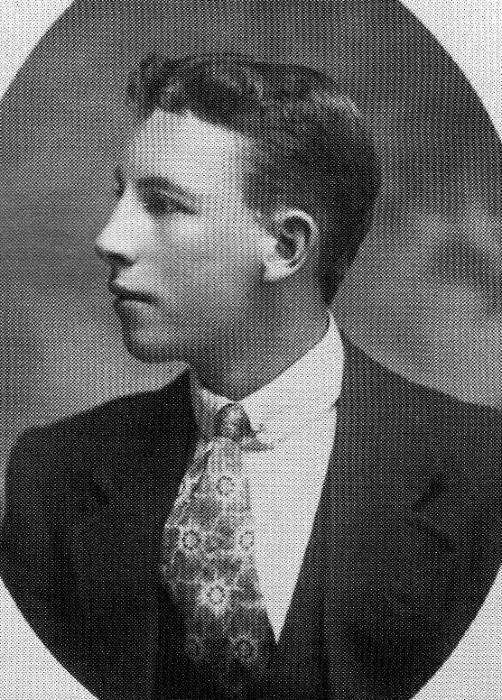 Oscar was born in June 1897 in Yarrawonga, Victoria to parents Frans known as Charlie and Diana nee Waylen known as Daisy. Oscar’s father was born in Sweden and was a sailor in the Swedish Navy. After leaving the navy he worked on a merchant ship until he jumped ship in Sydney and made his way to the Murray to start a new life. He originally worked as a wood cutter near Seymour, but his experience on the water drew him to Echuca and the paddle steamer trade. He started as an apprentice but quickly climbed the ladder and by 1898 owned his own ship. He married Daisy the year before and Oscar followed soon after. In 1908 Charlie built his own paddle steamer and named it the “Oscar W” after his young son. As Oscar grew his parents determined that he wouldn’t carry on the family business but rather he would work in banking. While still at school, Oscar was a member of the cadets and looked forward to joining the Militia when he was old enough. After finishing his schooling at Echuca State School he started working for the London Bank (Australia). After working in the Echuca branch he was transferred to the Hay, NSW, branch. In July 1915 a recruiting drive moved through country NSW including Hay. As a result, Oscar, at the age of 18 years and 2 months and with his family’s permission enlisted on the 5th August 1915 at Cootamundra. He was 5 foot 7 inches tall, weighed 147 pounds and had a fair complexion, hazel eyes and light brown hair. He left Sydney on the 30th September, aboard the Argyllshire. Originally assigned to the 4th Reinforcement of the 18th Battalion he was taken on strength by this battalion on the 10th January. He was then transferred to the 8th Battalion in Egypt on the 24th February 1916. On the 26th March he left Egypt arriving in Marseilles on the 31st before travelling across France by train to the Western Front. Oscar had a history of suffering from the cold and on the 22nd April he was sent to hospital with broncho-pneumonia. His recovery was drawn out and it was the 23rd December 1916 before he re-joined his battalion. He fell ill again in early January and over the next 5 months sent much time in hospital and it wasn’t until the 25th May 1917 that he joined the battalion again. For the next few months the battalion spent time resting and training until early September when it started making its way forward toward the frontline in the Ypres Salient. On the 20th September the 8th Battalion was in the third line of attack in the Battle of Menin Road moving through Glencourse Wood to their final objective just south of Polygon Wood. During this fighting Oscar was hit by a shell and killed. Originally buried near Clapham Junction, his body was exhumed after the war and re-interred in the Tyne Cot Cemetery. He was 20 years of age. The “Osar W” is one of the few paddle steamers to survive intact, and after receiving some renovation is still based at Signal Point in Goolwa. Some of the information above was sourced from the 2008 book “Flanders Fields and Paddlewheels” by Frank Tuckwell.